1500 Palestinian prisoners launch largest collective hunger strike in years: Take action in support! Over 1,500 Palestinian political prisoners have announced they will launch a collective hunger strike today, Monday, 17 April, on Palestinian Prisoners’ Day 2017. The strike, which will come under the slogan “Freedom and Dignity,” highlights a number of key demands of the Palestinian prisoners, including family visits, appropriate medical care, ending abusive conditions and stopping the use of solitary confinement and administrative detention, imprisonment without charge or trial. As the strike begins, Samidoun Palestinian Prisoner Solidarity Network urges supporters of justice around the world to take action to support the Palestinian prisoners whose bodies and lives are on the line for freedom and dignity. Palestinian prisoners from across political lines announced they would participate in and support the strike, especially in Hadarim, Gilboa, and Nafha prisons. Prisoners in Beersheva, Ashkelon and Ramon prisons will also launch their participation in the strike today, with more to come in the future, Ma’an News reported. The strike’s demands were announced by Fateh prisoners with imprisoned Fateh Central Committee member and prominent political leader Marwan Barghouthi serving as the spokesperson for the strike. A statement by Barghouthi highlighting the strike’s causes was published in the New York Times on 16 April. “Israel’s prisons have become the cradle of a lasting movement for Palestinian self-determination. This new hunger strike will demonstrate once more that the prisoners’ movement is the compass that guides our struggle, the struggle for Freedom and Dignity, the name we have chosen for this new step in our long walk to freedom,” wrote Barghouthi. As the strike begins, Israeli jails hold approximately 6,500 Palestinian political prisoners. This number includes nearly 60 women and 300 children. Nearly 600 are imprisoned without charge or trial under administrative detention, while over 1,000 are sick and require medical treatment. This is the largest collective hunger strike of Palestinian prisoners since 2012 and before that, 2004, when mass hunger strikes united thousands of Palestinian prisoners for key demands, many of which were achieved in those strikes yet have come under repeated and sustained attack. There is a lengthy history of collective hunger strikes in Israeli jails organized by the Palestinian prisoners’ movement, stretching back decades. While the strike was announced by Fateh prisoners with Barghouthi as their spokesperson, prisoners from the Popular Front for the Liberation of Palestine, Islamic Jihad, the Democratic Front for the Liberation of Palestine, Hamas, the People’s Party and others have declared participation in the strike, especially in prisons like Hadarim, Gilboa and Nafha, where there is nearly unanimous participation in the strike among political prisoners. Perhaps the last mass strike which saw such broad participation was the 2014 administrative detainees’ hunger strike which involved all of those Palestinians held without charge or trial – at the time, a number below 200. In Barghouthi’s piece, he urged international solidarity, noting the support of South African former prisoners of the anti-apartheid struggle for Palestinian prisoners. “Israel is not the first occupying or colonial power to resort to such expedients. Every national liberation movement in history can recall similar practices. This is why so many people who have fought against oppression, colonialism and apartheid stand with us.” Fateh prisoners also emphasized the importance of support for the strike, noting that it was “urgent” that their cause becomes an Arab and an international one, instead of only being supported on the local and national level. As 1,500 Palestinian political prisoners launch their hunger strike, we urge all supporters of Palestinian prisoners and the Palestinian people to urgently take action and join in the campaign of solidarity to achieve their demands. 3) Write letters and make phone calls to protest the violation of the rights of Palestinian political prisoners and urge your government officials to pressure Israel to accept the demands of the Palestinian political prisoners. 4) Boycott, Divest and Sanction. Join the BDS Movement to highlight the complicity of corporations like Hewlett-Packard and the continuing involvement of G4S in Israeli policing and prisons. Build a campaign to boycott Israeli goods, impose a military embargo on Israel, or organize around the academic and cultural boycott of Israel. 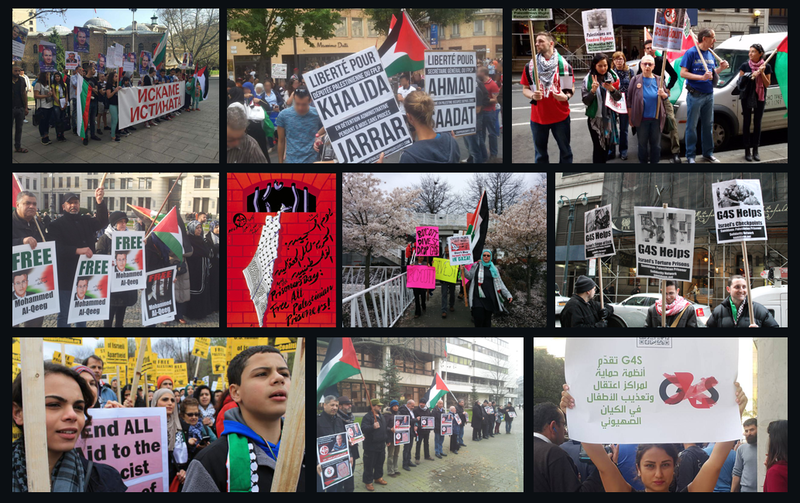 Materials to support your events and organizing are available for download here: http://samidoun.net/2017/03/call-to-organize-palestinian-prisoners-week-of-action-14-to-24-april-2017/ Please contact samidoun@samidoun.net or reach out to us on Facebook for questions or to share your actions. 1) Installation of a public telephone in each prison and section for Palestinian prisoners to communicate with their loved ones. B) Prisoners must be returned to prisons, clinics and courts and not kept at crossing points for lengthy periods.